Children (and their grown-ups!) 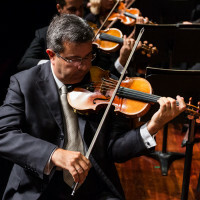 will be introduced to the instruments of the orchestra as they clap, sing and dance their way through stories and songs, well-known favourites and famous classics in these fun and engaging programs. Stay at the end of the performance to meet the WASO musicians and try some of our have-a-go instruments. 2019 Shows are currently in development! Please check back for program information. * For details of applicable concessions click here. Transaction fees apply.